This lady, born in 1920, is the grandmother of the bride. 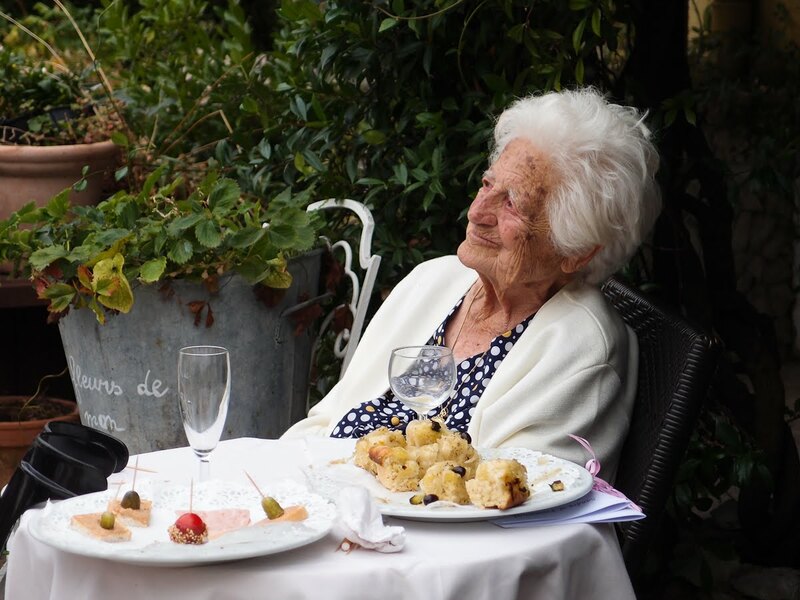 She sits outside the Restaurant Beausejour, a proud and contented expression on her beautiful face as she enjoys the celebrations taking place in the village square. Cette dame, née en 1920, est la grand-mère de la mariée. Elle est assise devant le Restaurant Beauséjour, une expression fière et satisfaite sur son beau visage, car elle apprécie ces célébrations qui ont lieu sur la place du village. Nice candid portrait. She really looks pleased. Lovely photo. She looks so happy. Good for her. And at her age, she can eat and drink whatever she wants. Wonderful shot. She seems at peace. I wish I was there to help her with the food still remaining on the table . . .
Great portrait, she is the same age as my mother. This takes me beyond words, except to say I love it. A Village Wedding - Block your Ears!